What do the Ouse Washes, the East Cambridgeshire landscape and Bradley Wiggins have in common? The last one probably gave it away: the relative flatness of the East Cambs landscape makes this – at least in theory – ideal cycling countryside. Since last year’s Tour and Olympic Games and certainly with the weather turning for the better recently, more and more people have been getting out on their bikes. Ely Cycling Campaign is one of the organisations active in our wider partner forum. Despite its name, it focuses on campaigning for better cycling facilities not just for Ely but also for most of East Cambridgeshire district. As such, this also includes a significant part of the Ouse Washes Landscape Partnership landscape area. Before I go on, I’d better first declare an interest here. Born in The Netherlands, I could probably cycle before I could run; Living in Ely, I thus also naturally joined the Ely Cycling Campaign as a member when some people set up this organisation over a year ago. OK, got that out of the way. So, what does the Ely Cycling Campaign have to do with the Ouse Washes? Well, the organisation has recently published an ingenious and well-thought out strategy setting out a vision for East Cambridgeshire for cycling as a safe, enjoyable, and practical way of travelling; this strategy does explain, for instance, the types of cycle infrastructure needed for the area to help encourage more people and a wider range of people to take up cycling. The Ely Cycling Campaign’s Strategy also includes an interactive map showing the ideal future cycle network. In reality, many of the lines drawn on this cycle network are currently still unsafe or even a dream. But already it has won over councillors and other people with an interest in planning: the cycle network may well guide future planning of road changes in and around Ely. 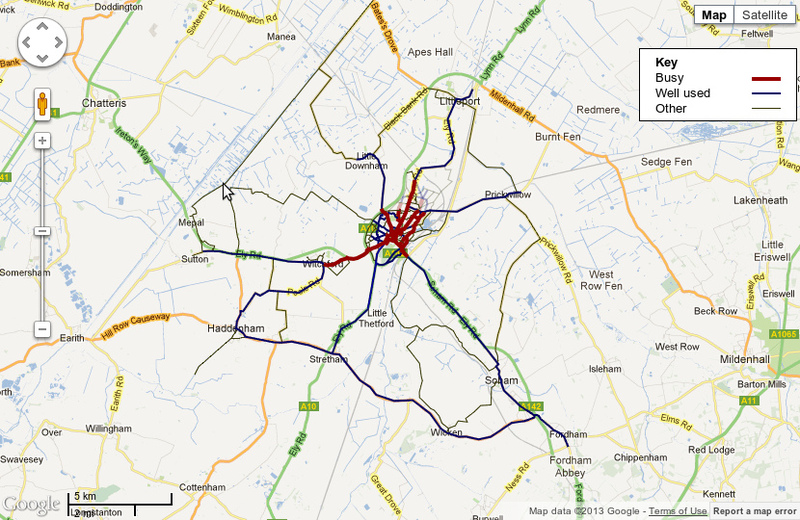 Ely Cycling Strategy’s proposed cycle network for the East Cambridgeshire District. Use the link above for the interactive version. As you can see in the above cycle network, the Ely Cycling Campaign is also campaigning for an improved off-road cycle route between Mepal and Bates’ Drove at the border with Norfolk further north, along the Ouse Washes itself, thus also linking up with the Welney Wetland Centre. This is already a bridleway at the moment, but could be improved to make it better for cycling, to ensure that more people can enjoy the countryside in a sustainable way. The national cycle routes 11 and 51 do also cross through the Ouse Washes Landscape Partnership area. See also this previous post for part of the 51 route through Fen Drayton lakes. Otherwise, there are surprisingly few cycle routes within the Ouse Washes Landscape Partnership area as a whole. A characteristic feature of the Ouse Washes Landscape Partnership area is that there are relatively few access points and limited public access opportunities. This has also previously been discussed in this post, and is being investigated and addressed through our Audience and Access planning work. http://pa.eastcambs.gov.uk/online-applications [Then type in ‘Coveney’ in the search box and it will come on at the top of the list]. An Environment Agency leaflet also gives some information about this pic.twitter.com/aY8Bbflv94. The scheme will see the creation of c180 hectares of new wetland, generated from former farmland. The main aim is to address the ecological deterioration of the nearby Ouse Washes with the impact of that deterioration on the breeding waders and wintering wigeon. The Coveney scheme will provide wet grassland habitat to offset the deterioration of the Ouse Washes, thereby helping the Government’s legal obligation to address this issue. See some more on the issue of the Ouse Washes’ deterioration in this previous post. With East Cambridgeshire having one of the fastest growing population nationally, and 2,500 new houses planned for Ely alone, there clearly is a need for further Green Space provision for local people. The new habitat creation scheme at Coveney does provide one, easily accessible area which – with the Ely Cycling Network outlined above – can also be reached by non-motorised transport means. I will keep you informed of further developments in the area. The Scheme’s lead partner, Cambridgeshire ACRE, met with the Heritage Lottery Fund on 13 September and was given the ‘green light’ to start work. I was very impressed with this project, both in terms of the submission document and the people and places we visited… Because of the compelling need and opportunity the LPS presents, the significant heritage, learning and participation benefits and the very strong project partnership and Vision,… I strongly recommend this project for HLF funding. I have seen few better Stage 1 LPS submissions. Thanks again to all partners for getting us to this stage of the Scheme’s development. It’s a great opportunity for the right countryside professional so if you know anyone who might be interested in applying for the role, please share this link with them. The closing date for applications is 31 October 2012. We’ll keep everyone abreast of developments via the blog. The Landscape Partnership will undertake conservation work on the assets of the area; tell the story of the history of the landscape and how it has been managed; encourage local people to get involved in managing the area today; encourage visitors and local people to learn about and appreciate the landscape; and improve the skills of local people by providing volunteering opportunities and work placements. The Ouse Washes Landscape Partnership area stretches 48.5km between Fen Drayton Lakes and Downham Market. The main features include the Old and the New Bedford Rivers, and the area of wet grassland 20 miles (32 km) long between them. This washland is internationally important for the large populations of birds which feed on it in winter. The area includes the well-established Welney and Ouse Fen nature reserves, and newer reserves such as Fen Drayton Lakes. The rural communities within the area have a rich archaeological and industrial heritage. The history associated with the land drainage: riots, disputes, disasters and engineering successes are unique to this area. We’re delighted that the Heritage Lottery Fund has given us this support. The Ouse Washes may not be ‘pretty’ in a picture-postcard sense but they have a unique charm of their own. Their cultural and built heritage needs to be celebrated and understood, both by those who live and work here and those who come to visit the area. This funding will allow us to work with local people and organisations to make this happen. As the Rural Community Council for Cambridgeshire, we feel privileged to be leading the Ouse Washes Landscape Partnership. The Ouse Washes Landscape Partnership is designed to help protect and celebrate a wonderful and distinctive part of East Anglia. This landscape is very much shaped by water flow – sometimes not enough and at the moment a little too much! With the Heritage Lottery Fund’s initial support the scheme can start developing work to promote the area as a tourist destination whilst also encouraging local communities to learn more about its history and how best to conserve and manage it for the future. At the meeting on Friday the partnership agreed to change the name of LP to “Ouse Washes: The Heart of the Fens”. Partnership members felt the word ‘heart’ was more appropriate due to the unique and important role the Bedford Levels play in the draining of the Fens. If you have any thoughts on this site or on the Landscape Partnership Scheme itself then please feel free to reply or comment on posts. We’d be delighted to hear from you and will endeavour to use feedback provided to improve this site or to feed into our application development work.